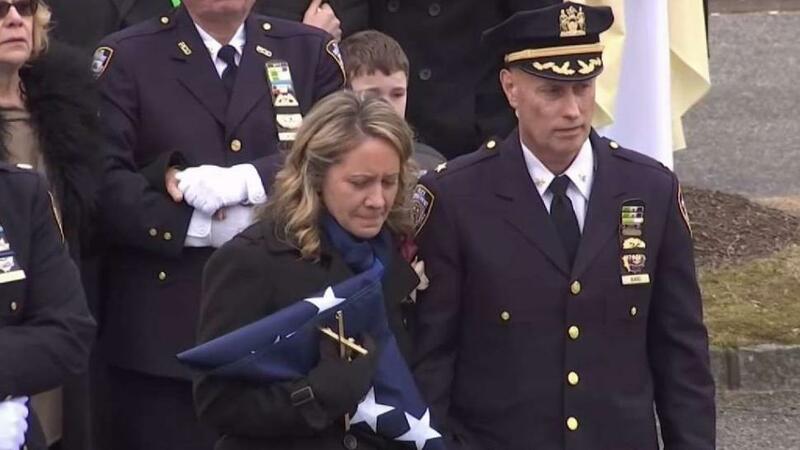 The funeral for NYPD Det. Brian Simonsen was held on Long Island Wednesday. Greg Cergol reports. An NYPD detective killed during a robbery in Queens last week was remembered as a loyal friend, a great detective and "an even better person" during a funeral that drew hundreds of mourners, including Mayor Bill de Blasio and NYPD Commissioner James O'Neill. Friends, family and fellow NYPD officers packed the Church of St. Rosalie in Hampton Bays Wednesday morning to remember Det. Brian Simonsen, a 19-year veteran who died on Feb. 12 after being hit once in the chest by friendly fire as he and six other officers responded to a robbery at a T-Mobile store. In a tearful eulogy, Simonsen's partner at the 102nd Precinct in Queens recalled his "infectious laughter," describing him as a "true friend" with a "generous personality." Simonsen took him in without hesitation when he was going through a divorce several years ago, with no money or place to live, he said. "Brian told me, 'Don't think twice, just grab your things and come to my house.' He took care of me for months — six months to be exact," the officer said. "Working with him was the best," he added through tears. "Brian was a great detective — that was clear to everyone — but he was an even better person." Simonsen's cousin, who is also an NYPD officer, noted that Simonsen lost his sister and his father within six months of each other at age 15. "These devastating tragedies would have broken many a man, but not Brian," his cousin said. "He had an amazing gift to turn a bad situation good." Simonsen grew up on the east end of Long Island, and he and his wife continued to live close by in Calverton — more than an hour's drive from the 102nd Precinct, where he worked his whole 19-year NYPD career. The detective turned down opportunities to work closer to where he lived, his cousin recalled. "He always said no, because Brian loved the 102nd," he said. His cousin also spoke of Simonsen's love for his wife, Leanne, whom he met in 2011. "Brian knew he had found the one," his cousin recalled. "We never saw him more happy and fulfilled." During the homily, the priest spoke of the "beautiful stories" friends and family shared about the detective after his death. Simonsen, who is also survived by his mother and grandfather, was known since childhood as "Smiles" for his bright, welcoming nature, colleagues and friends have said. "It was so interesting to read stories about Brian in the newspapers.... All the stories about people in the local bodega that he went to for his coffee in the morning, and always said, 'How are you?'" the priest said. "All those wonderful stories that we can share about Brian. When you share [those stories], he sits right there with you." Simonsen "did his job to the last second of his life," the priest noted. Mayor Bill de Blasio and NYPD Commissioner James O'Neill also spoke about Simonsen during the funeral. "Today, New York City is heartbroken," de Blasio said. "I think we can all agree we have lost one of our very best." O'Neill, meanwhile, had harsh words for the two men arrested in connection with the robbery Simonsen was responding to when he was hit by friendly fire. "The only two people responsible for Brian's death, the only two, are the career criminals who decided to go to that store... and commit an armed robbery," he said. O'Neill posthumously promoted Simonsen to first rank during the service. "Brian knew how to talk to people, but more importantly, he knew how to listen," O'Neill said. "Brian was the one you were grateful to see arrive on the scene." Two suspects in the robbery have been charged with murder in the death of Simonsen: the 27-year-old Ransom, who's accused of pointing a fake pistol at employees while demanding they put cash and phones in a black duffle bag, and Jagger Freeman, 25, accused of being the lookout, according to the complaint. Both men face additional charges including robbery and assault.